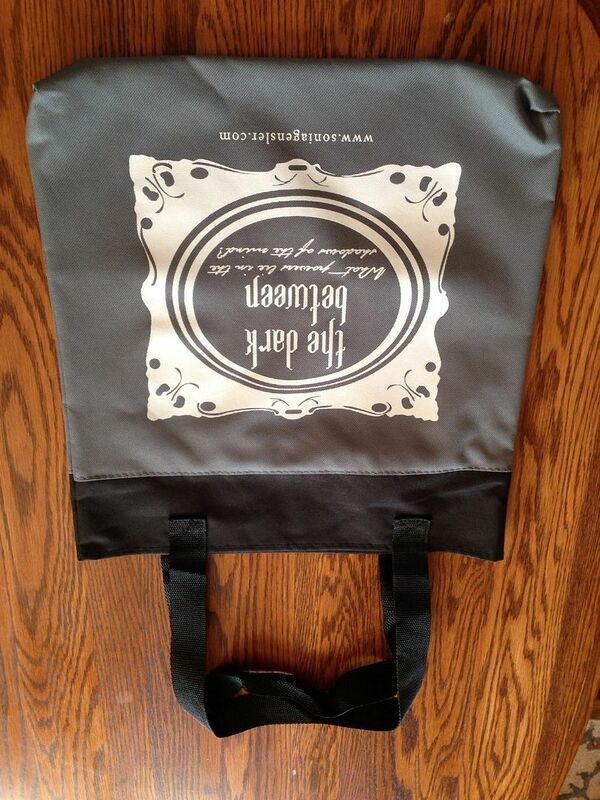 The Dark Between Blog Tour and Scavenger Hunt! The Dark Between is going on tour! Join our 10 stops along the way to learn more about the book AND to enter for a chance to win a cool prize pack, including a finished hardcover copy of your very own. CLICK HERE TO ENTER YOUR CODEWORD FOR EACH BLOG POST. You are allowed up to TEN total entries (one for each correct code)! Good luck, and thanks for your interest in The Dark Between! 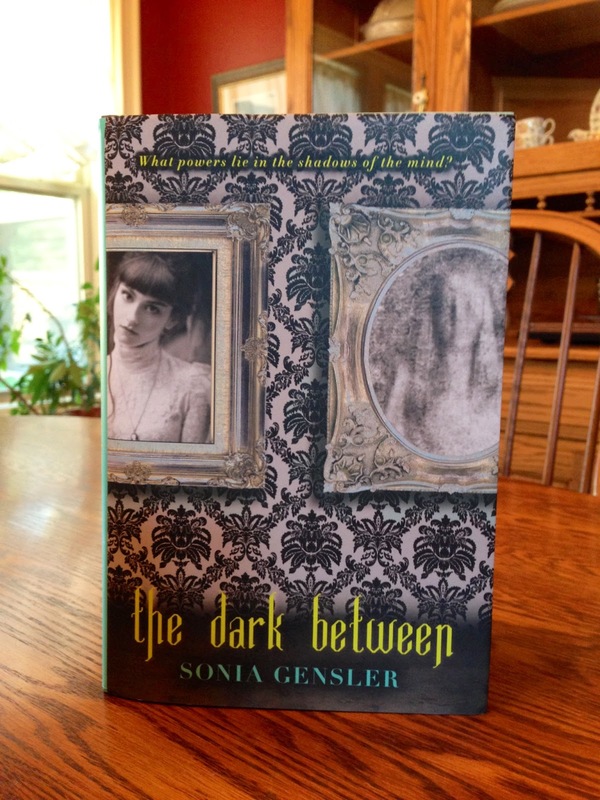 This entry was posted in Uncategorized and tagged blog tour, Dark Between, giveaway on September 14, 2013 by SoniaG. THE DARK BETWEEN is here! –AND a fancy notecard that I brought all the way back from Cambridge, England just for you! This giveaway is North America only. We’re doing things the old fashioned way — just comment below with your name/some way to contact you and you’re entered! Contest ends Tuesday, September 3, at 10:00 pm Central time. And please stay tuned for details on a Dark Between blog tour and a Novel Novice Book of the Month feature — more fun and giveaways just around the corner! 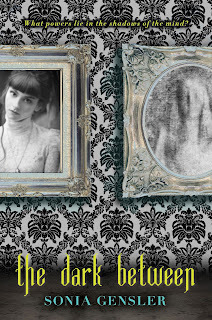 This entry was posted in Writing and tagged Dark Between on August 27, 2013 by SoniaG. Re-entry has been a challenge, but now that I’ve been home for a week, my brain seems to be making more of an effort. 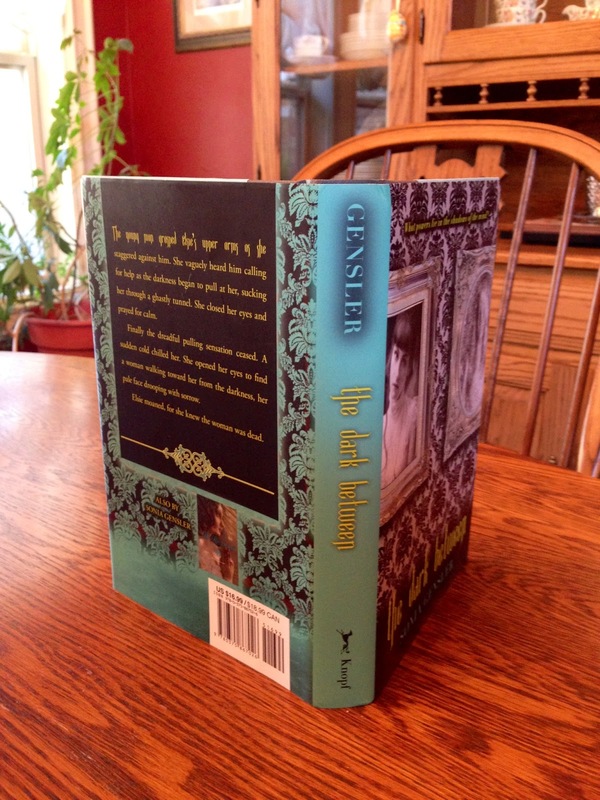 I’ve always loved the cover, but the aqua spine and back add such a wonderful punch of color, don’t you think? This entry was posted in Traveling and tagged Dark Between, kitty, Oxford on August 12, 2013 by SoniaG. Filming in Cambridge and . . . running away with the Circus! Last weekend was all work and no play in Cambridge. Of course, it’s always uplifting to be in the midst of such gorgeous surroundings, but we are not professional filmmakers by any means, so making a promo video for THE DARK BETWEEN took a lot of patience, creativity, and hard slog. Anyhoo, after a sweaty, crowded train from London, we arrived to a rather frantic and swarming Cambridge. Apparently Open Days were wrapping up. By that evening, however, the streets were pretty calm (as you can see above). 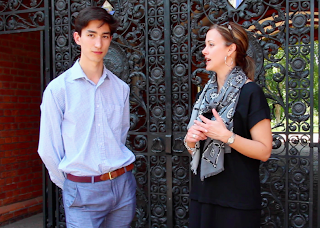 On Saturday we met up with Harry, a PhD candidate at Corpus Christi College, who provided a fabulous insider’s view of Cambridge and its history. My favorite part of the day was revisiting Newnham College, the inspiration for Summerfield in THE DARK BETWEEN. Our past few visits have been during the gloom and rain, but the sun came forth with a vengeance for our filming expedition. Aren’t the bright flowers wonderful? This flurry of filming came to an end with a 3+ hour bus ride back to Oxford that took place at exactly the same time as the Wimbledon showdown between Murray and Djokovic. Alas! But hooray for Blighty! Now . . . the circus. As far as I can remember, I never went to any sort of circus as a child and, to be honest, I never really wanted to — clowns have always scared me. Last week when we saw the old timey wagons pulling into University Parks, I was skeptical. But then I read more about Gifford’s Circus and learned that its founder, Nell Gifford, read English at Oxford before beginning her circus career. The reviews were positive (here’s a fun recap with photos), so we decided to give it a go. It was FABULOUS! A grand, old fashioned event under a tent with vaudeville comedy and music, magic shows, dressage demonstrations, and gasp-inducing acrobatics. At the end they invited all the kids to dance with the performers, and even after the performers left, the kids were still tumbling about, no doubt dreaming of running away with the circus. It warmed my heart, I tell you. And really, where else are you going to see a fawn on a tightrope? This entry was posted in Traveling, Writing and tagged Cambridge, Dark Between, England on July 9, 2013 by SoniaG. I had the entire weekend all to myself and, after a rough start with tornadoes and storms, it turned out to be a lovely extension to my birthday. Though I did get some writing and housework done, I mostly indulged in my favorite things. I also spent a fair amount of time in front of the TV. Rewatching Bright Star was particularly delightful — such a feast for the eyes and ears! But it struck me this time around how Jane Campion’s film is really about the drama and angst of young love — how it can be so fervid and profound, but at the same time somewhat self-indulgent and performative. 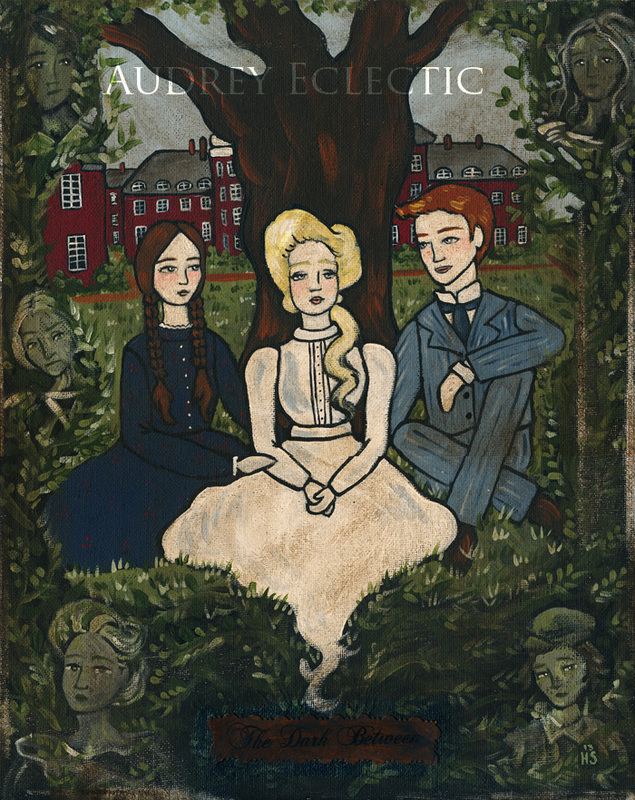 I could see all that (and hey, I’ve been there and done that), but I still ached for Fanny Brawne and John Keats. 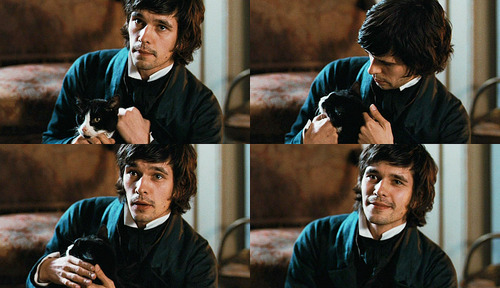 And, as always, watching Ben Whishaw with the cat made me swoony. What is it about men and cats? Oooh look — “Hot Guys with Cats”! Heh. This tumblr is cute, too. Along with TV, I indulged in reading. I finished The Visconti House by Elsbeth Edgar (in which two teens uncover the mysteries of a crumbling Italianate house), and read the first third of Kate Atkinson’s Life after Life (in which, to massively oversimplify, a girl relives her life over and over, adapting as she goes). I’m a huge Atkinson fan, having loved all the Jackson Brodie books as well as Behind the Scenes at the Museum, but I have a feeling this one will somehow manage to be even more fabulous. How will I get any work done? Finally, I gave myself a present by finally framing (& hanging) a painting created for me by the wonderfully talented Heather at Audrey Eclectic. 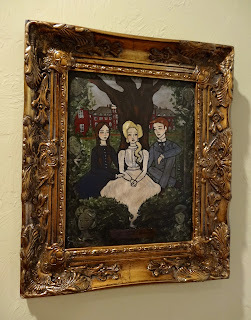 A while back I sent her an ARC of The Dark Between, and she painted a scene of the three main characters together. I love it so! Here you can see Kate (plain and pragmatic), Elsie (beautiful and languid — LOVE the drowsy eyes! ), and Asher (handsome and arrogant), sitting in front of Summerfield College, which is based on Newnham College, Cambridge. 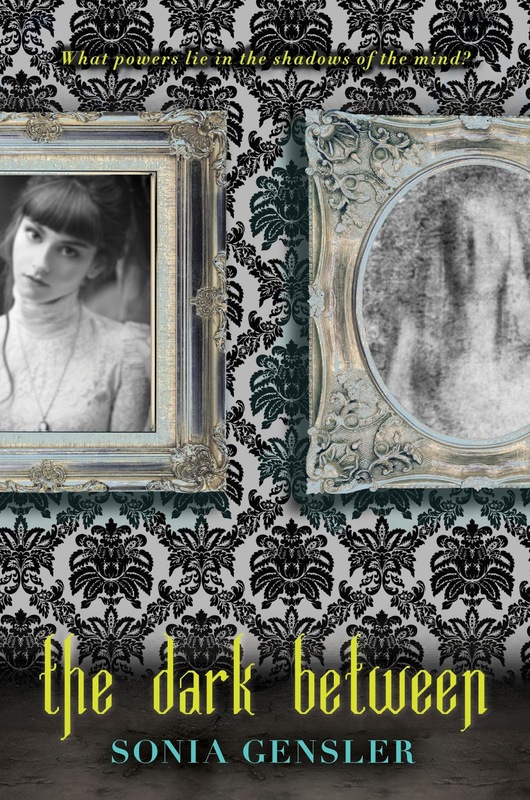 In the border you see the ghostly images of family members and loved ones who haunt the main characters, sometimes figuratively, other times literally. The frame is more ornate that I ordinarily might have chosen, but it seemed to fit the early Edwardian setting of the story. It looks wonderful on the wall! Stay tuned for a Dark Between ARC giveaway in which I might just offer goodies related to this painting. Weeee! This entry was posted in Reading, Watching and tagged Dark Between, reading, watching on June 3, 2013 by SoniaG.